SAE Institute Audio Technology Program graduate Autumn Leilani has begun a DJ residency at the Level 107 Lounge in Las Vegas’ Stratosphere Hotel. Because of my SAE schooling, I can troubleshoot any situation, play on any type of DJ system, and make any room sound great. Having a full understanding of audio science is a powerful thing, and it gives me an advantage over other DJs. SAE Institute Audio Technology Program graduate Autumn Leilani has begun a DJ residency at the Level 107 Lounge in Las Vegas’ Stratosphere Hotel. Leilani will perform up to five nights per week at Level 107, which was named “Best Place to View the City” by the 2014 Las Vegas Review-Journal Readers' Poll. A native of the San Diego area, Leilani has a musical family: her grandfather on her mother’s side was a vaudeville singer and multi-instrumental musician and her grandmother was a dancer. Growing up, Leilani had 12 hours of music and dancing lessons each week. She played the piano, sang, and performed/competed as a ballet, jazz, and tap dancer. While attending El Capitan High School in Lakeside, CA, Leilani joined local bands as a vocalist and developed her songwriting skills. After growing frustrated with the lack of commitment from her fellow band members, she became fascinated with the Southern California underground rave and house scene. 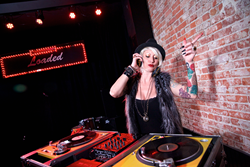 Having found her artistic calling, she decided in 2011 to pursue a career as a DJ and producer. Leilani found SAE’s curriculum to be challenging, but she realized that in order for her to succeed in the school’s Audio Technology Program, she needed to fully understanding the technical as well as the artistic side of music. Since graduating from SAE in 2013, Leilani has produced her own house music tracks as well as recorded/produced for other artists. Her most recent studio project, Planet Mischief, incorporates live instrumentation along with programmed synths and drums. The majority of Leilani’s professional time is taken up with her busy DJ schedule. Her list of corporate clients includes Pioneer, Slate Digital, the 2014 Hard Festival, L.A. Fashion week, LA Weekly, “So You Think You Can Dance”, “American Idol”, Adidas, and many more. Leilani’s advice for SAE students and grads who would like to pursue careers as a DJ/producer is simple: follow a schedule and stay positive. SAE Institute provides aspiring creative media professionals with a foundation of practical theory and valuable hands-on training in their chosen areas of concentration. Under the guidance of our faculty, which is comprised of working industry professionals, students gain the essential experience they need for entry-level jobs in the entertainment business. Our students are supported in their job searches by SAE’s international network of alumni, many of whom are leaders in the music, film, game arts, and live performance arenas. We offer programs in audio technology across our seven US campuses, along with a music business program at select locations, all fully accredited and focused on preparing students for employment when they graduate. Bachelor’s Degree programs in Animation, Audio, Film, Game Art &amp;amp; Graphic Design are available at the two locations of Ex’pression College, which is owned and operated by SAE Institute Group, Inc. SAE Institute Group, Inc. is a part of Navitas LTD. Learn more at USA.sae.edu.